Why WhatsApp Message Deleted Before Read? If you are new on WhatsApp, you can see that someone has deleted message before you read and you can be curious why your contact deleted that text? 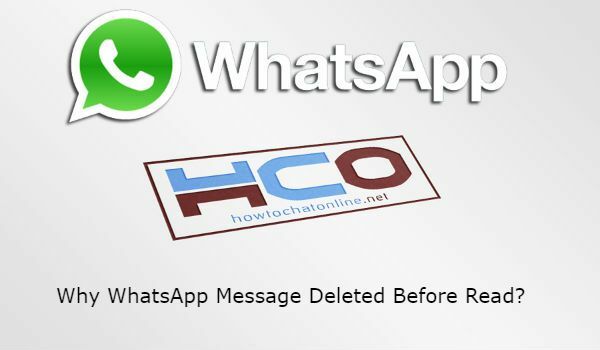 WhatsApp has released a new feature recently and the application allow users to delete their messages in a few minutes. So people can delete their message because they have sent accidentally or they can remove those texts which they have regretted to sent. You can also use this feature of the application on your iPhone or Android devices too. Does WhatsApp Delete the Message? You can read those messages with notification history applications. We recommended some of those applications on How to Chat Online for you. You can see all those applications at the link we have provided for you above. If you have any questions regarding this, you can comment this page. Your friend has sent you harsh message because of a reason and he/she regretted about it. One of your contacts has sent you a message accidentally. Your friend sent you a message while he/she want to message someone else. The answer of this question is “no”. WhatsApp doesn’t delete messages on conversations. Only users can do it. So no need to worry about that. This question has been asked by a user of How to Chat Online. You can comment this page to ask your questions.